Virtual Reality (VR) is the latest technology in the cam streaming industry. 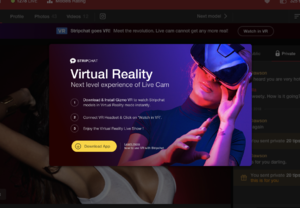 Here at Stripchat we like to stay ahead of the competition and that is why we created the best VR streaming experience available. VR is simply another way users and models can use to interact with each other. • For the best user experience it is recommended to purchase tokens before launching the VR application. 1. Download & Install the GizmoVR Player app related to your device at https://gizmovr.com/. 2. Type "stripchat.com" in the GizmoVR address field. VR models will be marked with a VR label. You can also watch 2D models with your VR device. Please note that iOS & MacOS versions of VR will soon be available as well. The VR application is in its early stages and we are continuously trying to find ways to improve it, with many new features coming soon. This page was last edited on 12 February 2019, at 10:37.